In 2015, the debate on financial regulation has more or less ignored the actual changes to largest U.S. banks. Three facts have been hard to square. Assertions about “rolling back Dodd-Frank” continue despite zero legislation passing and being signed by the President this year. Even the contents of proposals target community and regional banks, not large banks. Politically, recent questions are centered on a modern Glass-Steagall, as if Dodd-Frank never happened. Meanwhile, this year regulators are finalizing important rules that increase capital far above international standards. In fact, total loss absorbing capacity is set to be greater than 20 percent of risk-weighted assets, 4.4 to 5 times the losses projected by the Fed under the most severe scenario in the stress test. The fact is reform has dramatically changed the largest banks. Capital has doubled. Liquidity has tripled. Large banks have reduced legal entities by 20 percent. Four of the largest banks have shrunk and overall the largest banks have grown far slower than the U.S. economy, regional banks, and community banks. This presentation provides a summary of these significant changes. To date, the six largest banks have increased their core capital by 78 percent and their median simple leverage ratio by 46 percent since the quarter before the crisis. Large banks have also more than tripled their liquid assets. All six institutions have made signification reductions and have reduced legal entities by 20 percent since 2009. Goldman has trimmed $250B in assets, Morgan Stanley has reduced its assets by 22 percent, Citi has shed $700B in noncore assets, BofA has eliminated 746 legal entities, and JPM has cut ties with more than 2,000 customers who were creating regulatory burden. Large banks’ holding companies have only grown 0.23 percent since the crisis compared to 20+ percent growth by smaller bank holding companies, reducing financial market concentration. New rules like ISDA’s 48 hour-stay on derivatives and the Fed’s total loss absorbing capacity (TLAC) rule ensure creditors, not taxpayers, absorb losses during failure. These developments will help facilitate resolution of a large bank failure. 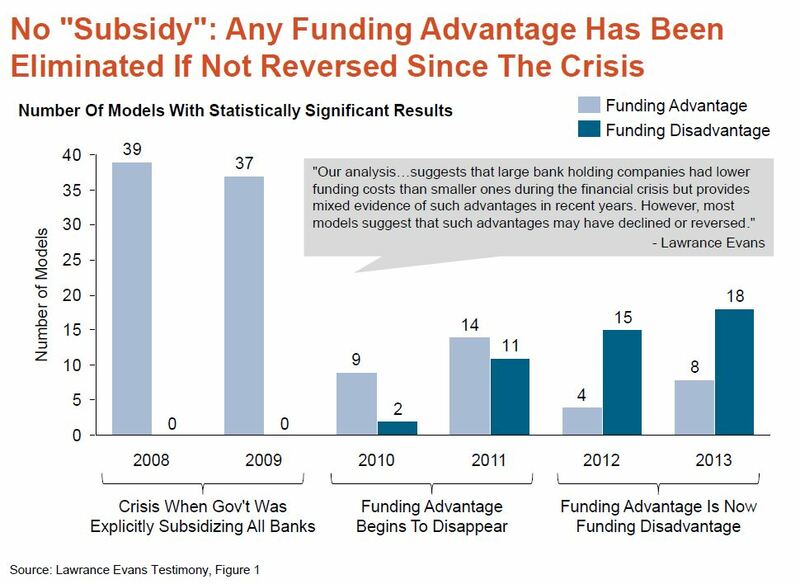 Any potential funding advantage of large banks due to market perceptions of government support has been eliminated or even reversed. Academic research, the recent GAO report, and credit ratings all point to this conclusion.